Our most absorbent pad. 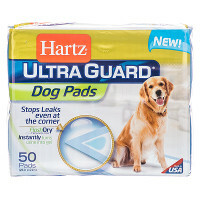 Hartz® UltraGuard® Dog Pads stop leaks even at the corner of the pad. Flash-Dry® Technology instantly turns urine into gel.